What is Modbus? It is a royalty free serial communication protocol where many devices in a network can exist together and information being transmitted in the network. It was developed way back in the year 1979 by Modicon and is widely used in many industrial equipment. 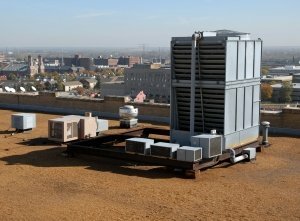 If there are many air conditioner units in a building, it makes sense to implement this protocol where there can be a master and up to 247 slaves. The master will initiate most of the request for information and the slaves will provide the information needed. In this way, you can have a central workstation where all the activities of the HVAC equipment can be controlled and monitored. This also makes trouble shooting easier by incorporating error messages for each unit. A chart that display all the relevant data to the supervisor of the building can be done by collecting all the data such as set temperature, room temperature, humidity and pressure. In order to identify each of the device, there is an addressing for the slaves known as Slave ID. Each slave is assigned a number from 1 to 247 and in the messaging format, the first byte indicates the address of the slave. Hence, when all the devices receive the address, only that particular slave will respond to the request from the master. The rest of them will just ignore the information that is received. In the early days of serial communication, error checking is done by the use of Cyclic Redundancy Check or CRC. This is achieved by processing each byte of the messages sent and transmitted as well. The receiving device will collect each byte of the messages and process them using the same algorithm. They are then compared and if they differ, it means an error has occurred. Most HVAC equipment need electronic controls and it is always a good idea to do a proper study before embarking into this networking project. If cost is a critical factor, one idea is to provide modular design into your controller i.e. if networking is required, plug in an additional networking card that will enable this serial communication to work. Proper testing need to be thoroughly done by connecting the maximum units designed and tested over a period of time. Electromagnetic compatibility testing such as electrical fast transient, surge testing and electrostatic discharge testing are some of the critical tests that should be done. More information about EMC testing can be obtained here. Over time, many other versions of protocol have been developed. The most widely used is still the Modbus RTU as explained above. There is also protocol for communication over TCP/IP networks. Other versions are also available for your use depending on your design requirements.